Yes, another jacket! As if I needed another one. So I decided to take a trip to Goldhawk Road, all the way from Birmingham, where we already have some good fabric shops. I did have some ideas about what I wanted to buy when I set off, but hey ho! In fact, I didn’t even notice this fabric when I first walked into the shop. I was on my way out when inspiration suddenly hit me. That fabric would make a good, go-with-nearly-everything, jacket! And it does. 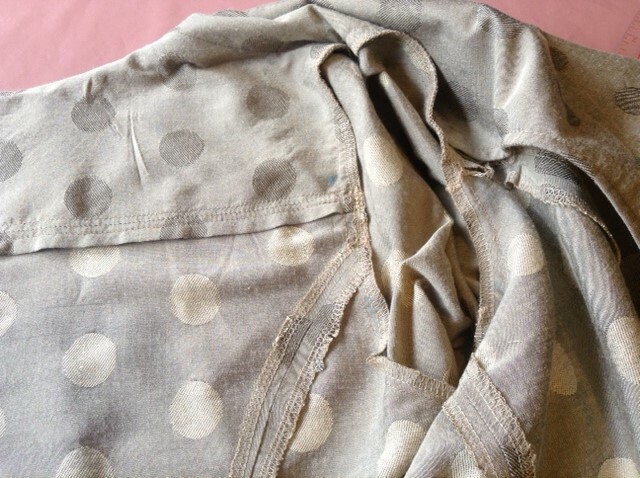 I have worn it several times, and washed it successfully. It’s even come through the rigours of being packed for a week working in London, and had my heavy rucksack on its back. 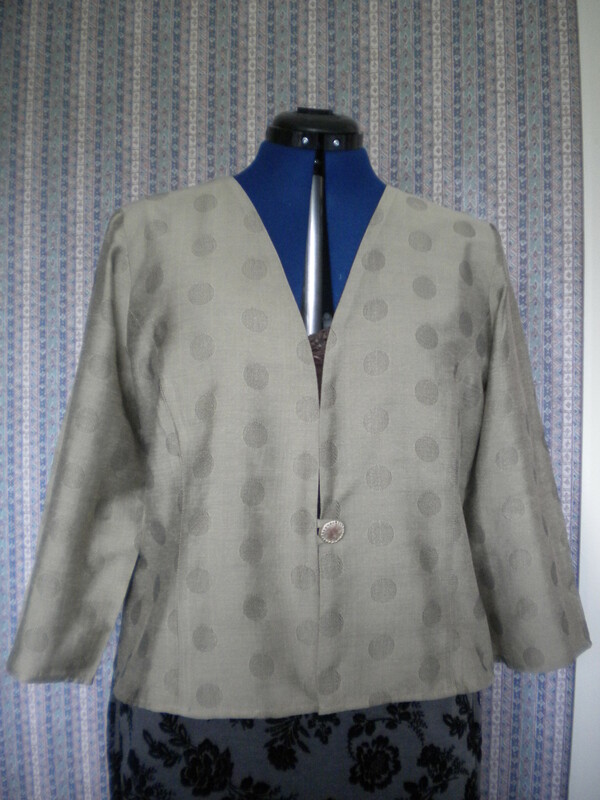 I already have several variations of jacket from this New Look pattern. This one is different again. It’s not lined. I created a neck facing, and used the front facings, over-locked all of the inside seams, and now I have a jacket. My original idea was to just bind all of the edges, which would have made the jacket lighter weight, but the binding may have caused it to hang badly down the front, so I didn’t risk it. Having said that, the button, from stock, is quite heavy, but does a good job. I have a slight regret that I didn’t cut it a little bit longer. I had the fabric to be able to do so, and then it would have perhaps made it even more wearable. Instead, I have cut a scarf from the remaining fabric, which just covers the neck opening on chilly mornings. The scarf was the very first thing that I made using the rolled hem function on my over-locker. So easy! I then fringed the scarf, slightly to my surprise, with matching green fringing. That took a bit of a trawl round the market to find the best match. And now I find out that Khaki is trendy this year. I will be doing this again, and cutting it a bit longer. I just need to keep an eye out for the right fabric again. I have a jar full of buttons, and I don’t know where most of them came from. I’ve had the jar for years. It may even date back to my previous sewing life, over 25 years ago. Some of them are spares that I recognise from bought garments. But if all I need is one, or even two buttons, I don’t bother going to a shop. I just go to my jar. I had a choice of 3 lined up for this jacket. And now I love to use self-covered buttons, so I may never need to go to a shop selling buttons again! This entry was posted on October 7, 2014 by ann hebden in Fashion, Jackets, Sewing and tagged Fashion, Handmade, Jacket, Sewing.